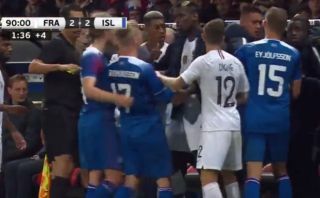 Manchester United midfielder Paul Pogba got heavily involved as things got a little heated between France and Iceland. The 25-year-old can be seen initially coming in as peacemaker as this brawl breaks out on the sidelines after a cynical challenge on France star Kylian Mbappe – not the most aggressive by any means, but one that came when the youngster was running at great speed and which showed little intent of getting the ball. Pogba then appears to get wound up and a little provoked, going over to the referee to make his opinion heard even though he wasn’t even on the pitch at that time. The former Juventus man got up off the bench to get his point across, with Raphael Varane eventually having to encourage him to stay out of the whole thing.